United Kingdom from the English. 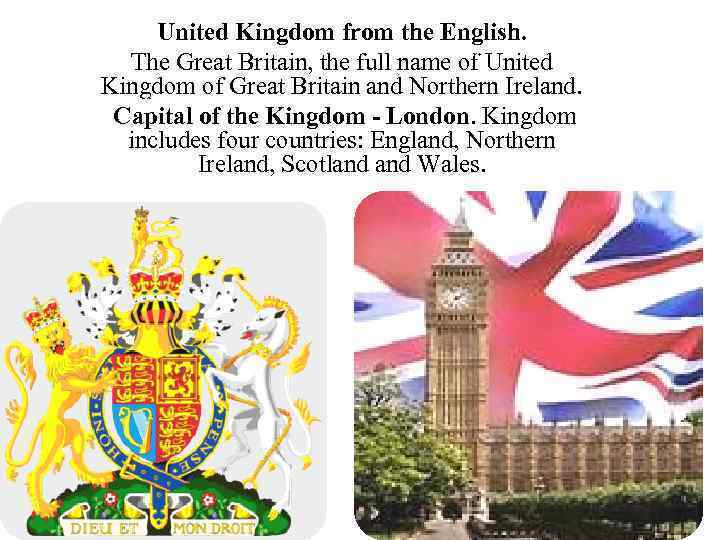 The Great Britain, the full name of United Kingdom of Great Britain and Northern Ireland. Capital of the Kingdom - London. Kingdom includes four countries: England, Northern Ireland, Scotland Wales. 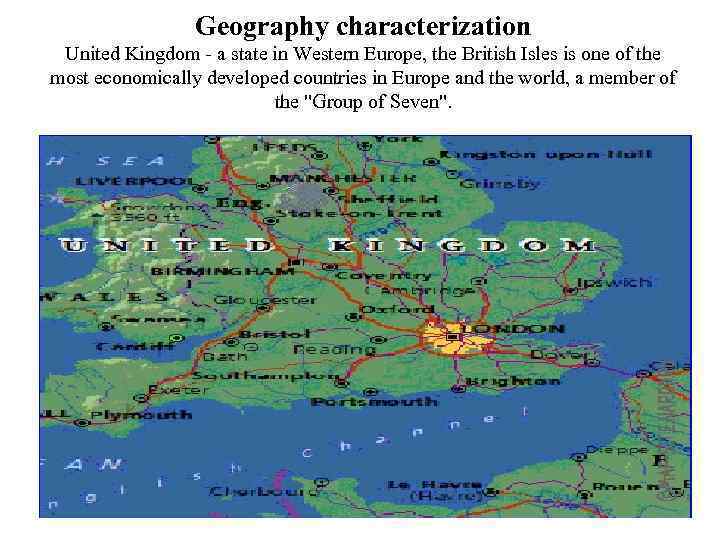 Geography characterization United Kingdom - a state in Western Europe, the British Isles is one of the most economically developed countries in Europe and the world, a member of the "Group of Seven". 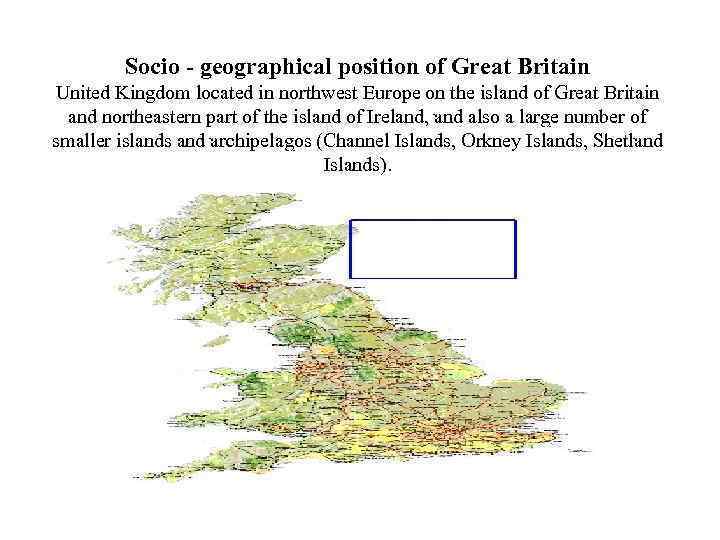 Socio - geographical position of Great Britain United Kingdom located in northwest Europe on the island of Great Britain and northeastern part of the island of Ireland, and also a large number of smaller islands and archipelagos (Channel Islands, Orkney Islands, Shetland Islands). 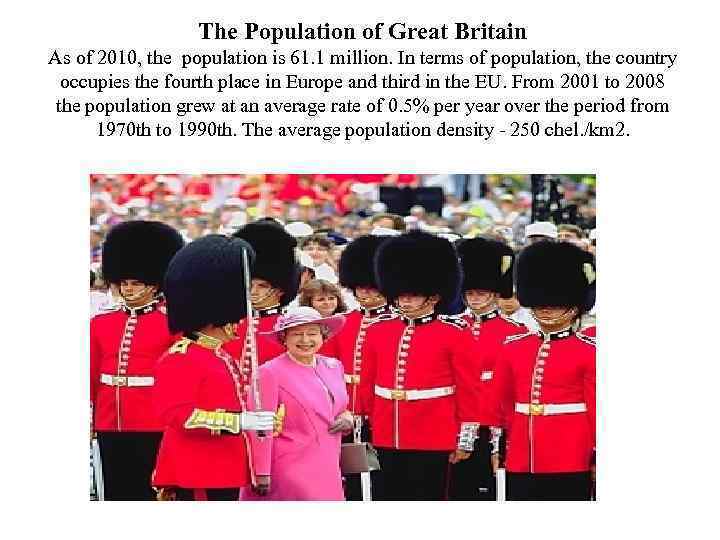 The Population of Great Britain As of 2010, the population is 61. 1 million. In terms of population, the country occupies the fourth place in Europe and third in the EU. From 2001 to 2008 the population grew at an average rate of 0. 5% per year over the period from 1970 th to 1990 th. The average population density - 250 chel. /km 2. 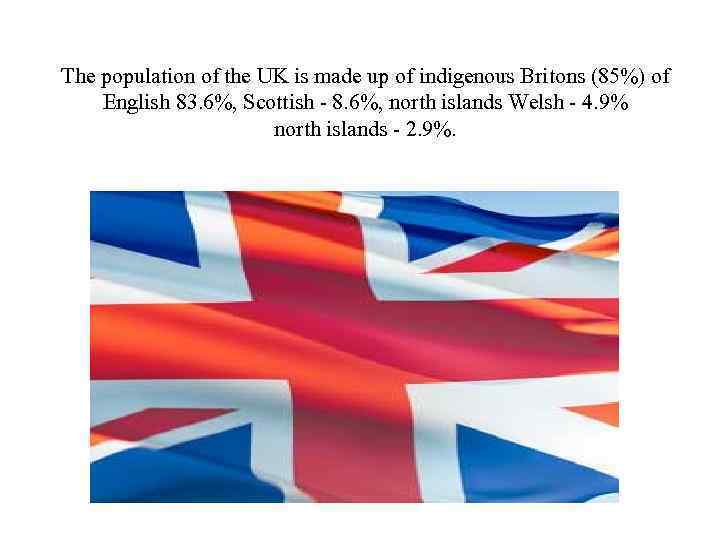 The population of the UK is made up of indigenous Britons (85%) of English 83. 6%, Scottish - 8. 6%, north islands Welsh - 4. 9% north islands - 2. 9%. 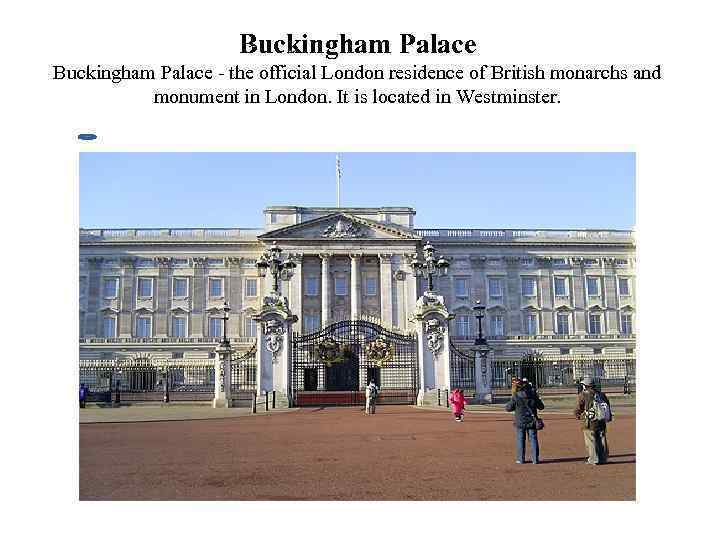 Buckingham Palace - the official London residence of British monarchs and monument in London. 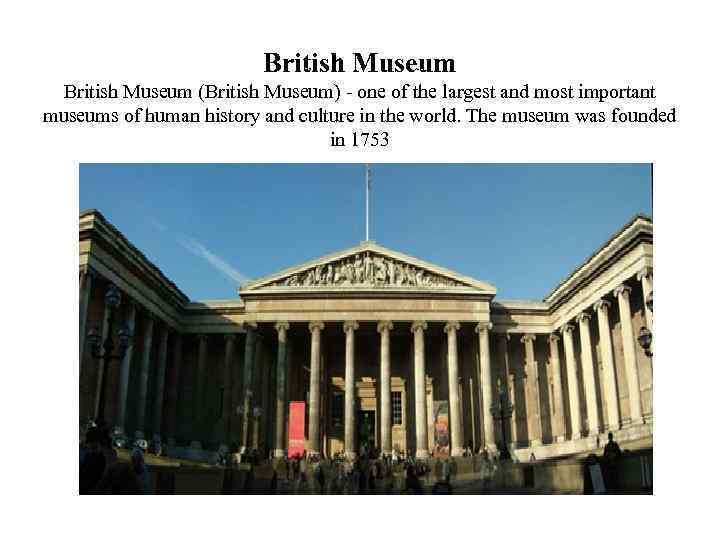 It is located in Westminster. 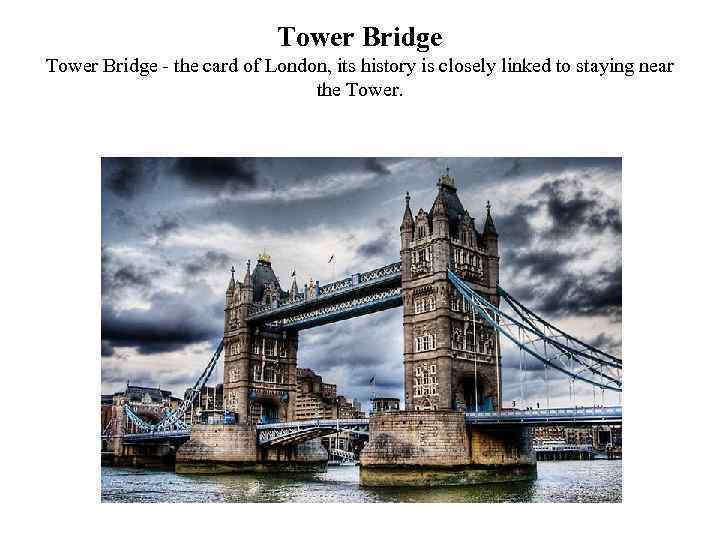 Tower Bridge - the card of London, its history is closely linked to staying near the Tower. 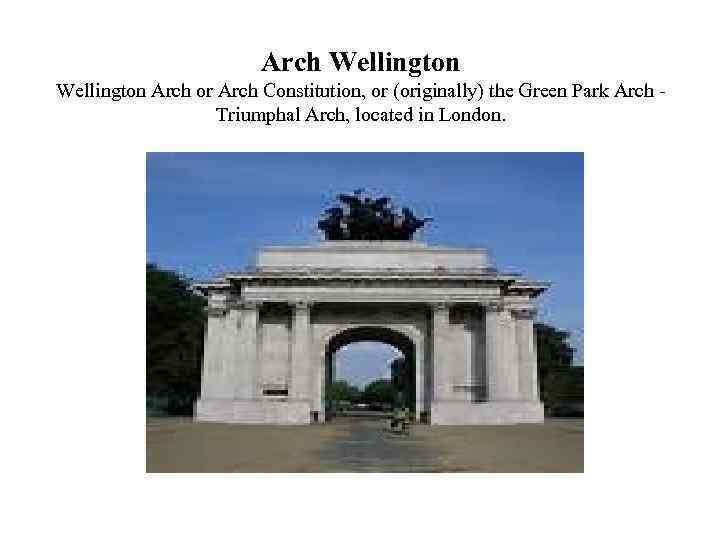 Arch Wellington Arch or Arch Constitution, or (originally) the Green Park Arch Triumphal Arch, located in London. Big-Ben Big Ben, the voice of London, showing the exact time since 1859. 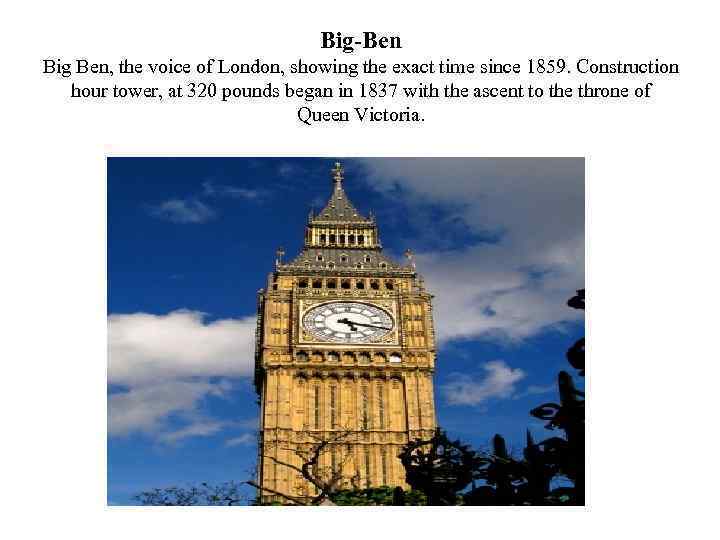 Construction hour tower, at 320 pounds began in 1837 with the ascent to the throne of Queen Victoria. 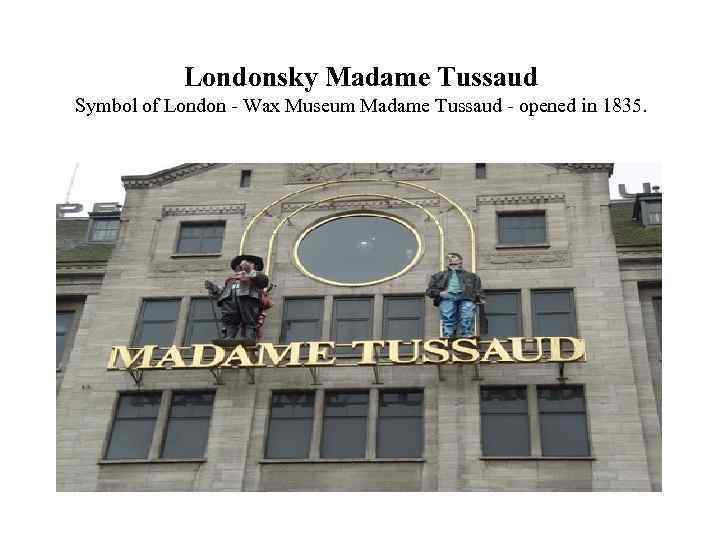 Londonsky Madame Tussaud Symbol of London - Wax Museum Madame Tussaud - opened in 1835. 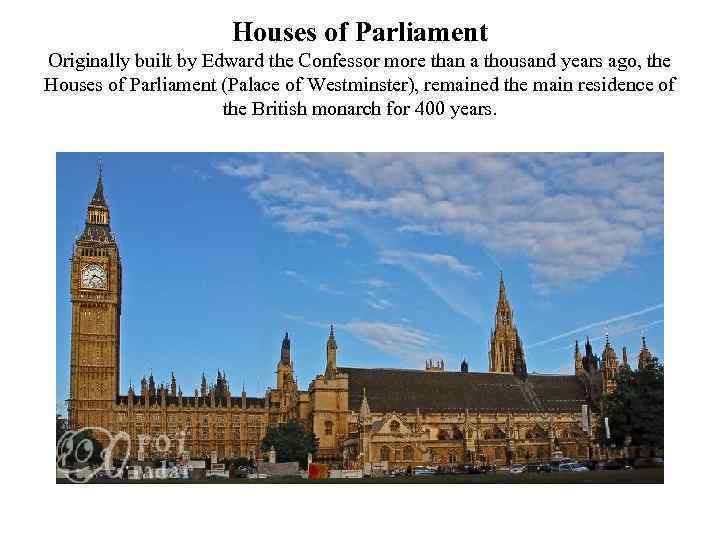 Houses of Parliament Originally built by Edward the Confessor more than a thousand years ago, the Houses of Parliament (Palace of Westminster), remained the main residence of the British monarch for 400 years. 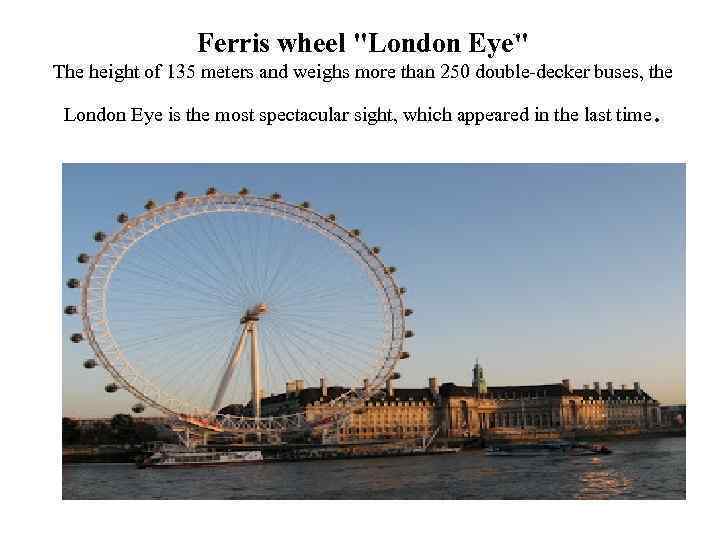 Ferris wheel "London Eye" The height of 135 meters and weighs more than 250 double-decker buses, the London Eye is the most spectacular sight, which appeared in the last time . 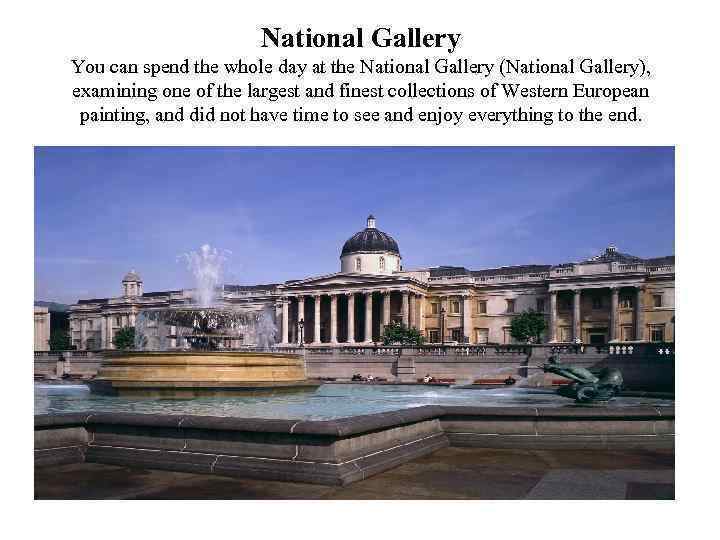 National Gallery You can spend the whole day at the National Gallery (National Gallery), examining one of the largest and finest collections of Western European painting, and did not have time to see and enjoy everything to the end. 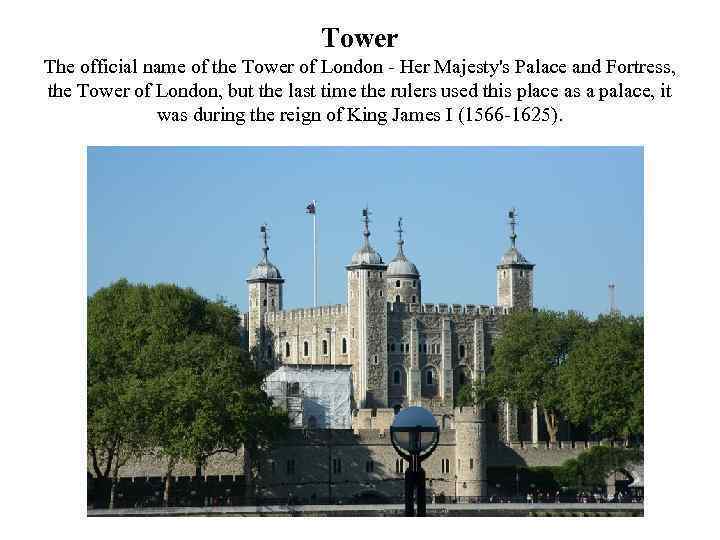 Tower The official name of the Tower of London - Her Majesty's Palace and Fortress, the Tower of London, but the last time the rulers used this place as a palace, it was during the reign of King James I (1566 -1625). 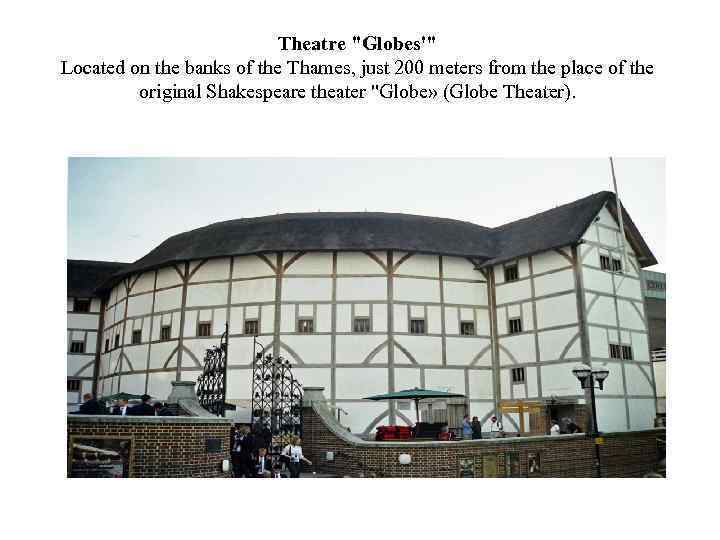 Theatre "Globes'" Located on the banks of the Thames, just 200 meters from the place of the original Shakespeare theater "Globe» (Globe Theater). 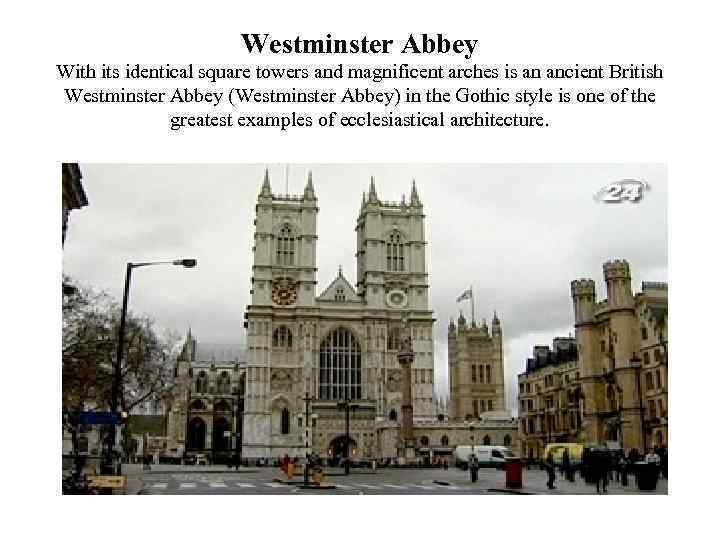 Westminster Abbey With its identical square towers and magnificent arches is an ancient British Westminster Abbey (Westminster Abbey) in the Gothic style is one of the greatest examples of ecclesiastical architecture.